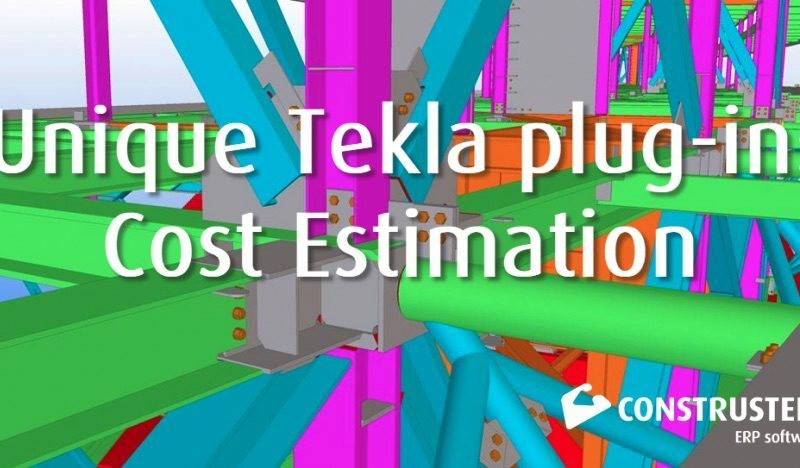 ConstruSteel takes Tekla integration to the next level: unique development in Tekla Structures for the benefit of cost estimation. The selected parts of the 3D model (or the whole model) form the basis for further processing in the module Cost Estimation. ConstruSteel developed a specialized plug-in that makes it possible to directly import 3D projects from Tekla. All the details of the construction are added and cladding such as: materials, hours, stock, etc. can be entered. Based on this information a quotation can be made by just a few clicks. We offer companies a 30 day free trial. The plug-in can be downloaded from the Tekla Warehouse. The specific cost estimation module can be used as a stand-alone application for structural steel companies for one or more users, but is also included in the estimation & CRM bundle. Materials can be imported automatically but manual input is also possible, including advanced shortcuts for structural steel materials and operations. The cost estimation module makes it possible to import 3D projects from CAD / BIM systems as Tekla Structures Steel Detailing (Xsteel). – Automatic calculation of total weight, square meter, etc. – Simply adjustable pricelists, conservations, discounts, etc. – Cost price and cost estimation of materials, hours, surcharges, etc. If you are interested in our solutions, please contact us or use the contact form to get more information.